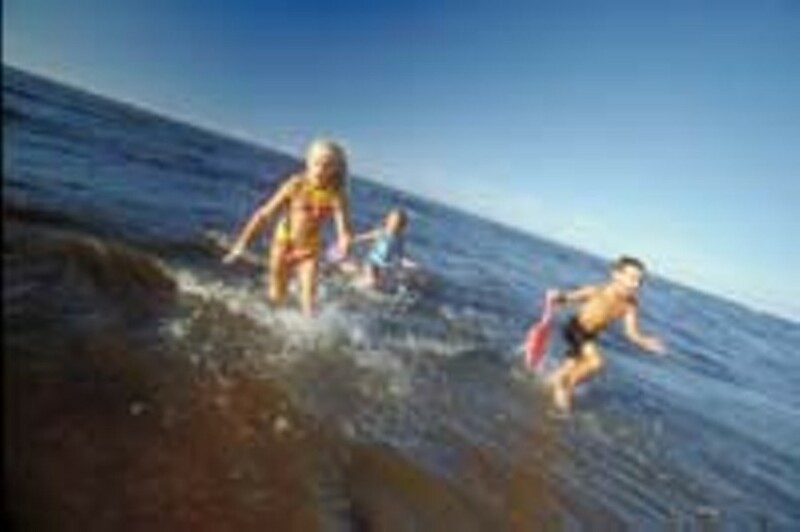 File photo Frolicking at the source: kids at play in Lake Ontario, part of the Great Lake basin. Where there's water, there's life. If the water is threatened, however, so is the life. That's the message environmentalists have been trying to get across for years concerning the Great Lakes basin, which, in the later half of the 20th century, has taken a huge hit from development and misuse. Finally, the message may be getting across. A number of Great Lakes management reforms are scheduled to be enacted this summer, and, in anticipation, the New York State Assembly held a public hearing in Rochester last week to address the threats to the basin and surrounding region. Issues ranged from water quality to the agricultural consequences of heavy pollution and overuse of the area and its wetlands. Many are the same problems that have been a plague to the basin for decades, and environmentalists are hoping the issues may finally be addressed. "We need a better system of managing water usage in both legal and moral terms," said Reg Gilbert, the senior coordinator of Great Lakes United, one of nearly a dozen witnesses asked to testify. "We need to protect that water from the long-term plan of an increasingly thirsty world," Gilbert said. The Great Lakes basin is the world's largest freshwater ecosystem. It consists of almost 20 percent of the world's, and 95 percent of the country's, fresh surface water. In total, the lakes encompasses an estimated 700 miles of shoreline. In 1985, as part of an effort to reverse decades worth of environmental damage caused by pollution and water withdrawals, the eight states bordering the lakes joined the provinces of Quebec and Ontario to adopt the Great Lakes Charter. The charter was amended in 2001 to tighten controls of the lakes' resources and to close loopholes that allowed high-pollutant development to occur in the area. The amendment, titled Annex 2001, is expected to be finalized and implemented this summer. The damage caused by pollution and sprawl to the lakes' ecosystems could have catastrophic ramifications, several of the witnesses said. A "delicate balance" must be maintained between water usage and supply refill of the basin to ensure the lakes' survival, said Donald Zelazny, the Great Lakes program coordinator for the state Department of Environmental Conservation. "Overuse would be catastrophic environmentally and to the water supply," Zelazny said. Using brownfield laws and congressional protections, "we will be able to restore New York's indispensable water resources," he said. One reason the last 15 years or so have not brought about a reversal in the basin's troubled condition is the "no net loss" policy initially enacted by President George Bush Sr., Gilbert said in a telephone interview after the hearing. The law was meant to protect wetlands and halt the decline of overall wetland acreage in the country. The program allows developers and landowners to destroy wetlands if they create or restore others at another site. But the policy says only that the same acreage must be restored. It says nothing about how efficient the new wetlands must be in sustaining a vital ecosystem. "We're losing wetlands," Gilbert says. "Someone pours water in a low-lying area and thinks that's a wetland." A panel convened by the National Academy of the Sciences several years ago found many instances where the construction of substitute wetlands was often delayed or left incomplete. When the projects were finished, many failed to meet required environmental standards and many others simply did not duplicate the ecological functions of the natural wetlands that were buried. Environmentalists offer several solutions they say must be implemented to put a halt to the damage caused to the basin. One of the biggest threats to the basin and its resources is sprawl, where development consumes land at a faster rate than the growth of the population. "We need to use land and re-use buildings within existing urban boundaries," the advisory reads. The solution, according to the group, is to require future land-use plans to take into account surrounding ecosystems. Projects should be planned around the environment to ensure minimal loss of vital lands and wetlands. Provisions from the agenda have been included in Annex 2001. The hearing was led by Thomas DiNapoli, the chair of the Environmental Conservation Committee, who was joined by state assemblymembers Richard Smith and David Koon. In addition to pollution and development, several additional areas of concern were addressed, among them the issue of water withdrawal from the lakes. "Though these trade agreements may not be a problem today, the trend is they will be a problem," Gilbert said. The Great Lakes basin needs to "protect itself from the long-term threat by changing the basis of its water-use laws," Gilbert said. "Making this water source available to people outside of the basin could have a detrimental effect," Gilbert said. Local governments must reject potentially lucrative water-diversion projects because they are harmful to the lakes and their vital ecosystems, he told the panel. "The question is, as a region, are we willing to put up with the inconveniences of higher standards?" Gilbert said. "Wisdom and care for our children and our grandchildren's welfare" demand that we must, he added. In addition to monitoring the levels of water removed from the lakes, the basin's managers must also be careful about what is brought into the lakes. Severe damage can be done to basin's ecosystems by foreign species introduced by ships from ports all over the world, several of the witnesses testified. Many of these foreign species are brought to the lakes through the ballast waters of ships passing through the basin, said Raymond Vaughan, an environmental scientist with the Attorney General's Office. When an ocean liner is on the open sea, it pumps water in and out of internal tanks, picking up organisms and dropping them off in completely foreign ecosystems. "Once aquatic invasive species are introduced, control and eradication become impossible," Zelazny said. It is a "global problem with local ramifications." One long-term solution to address all these matters, suggest some environmentalists, is to establish a non-partisan, scientific institute or laboratory of some kind in the basin region to study large lake development and management. New York is the only basin state or province that does not have such a facility. "One would hope that as we move forward, the science would overcome the politics," DiNapoli said.